The New Canadian Ambient Air Quality Standards (CAAQS) for NO2. Our air is composed of nitrogen (78%), oxygen (21%) and argon (almost 1%) i. When fossil fuels are burned nitrogen oxides (NOx), including nitrogen dioxide (NO2), are formed. NO2 contributes to the formation of ozone and at high concentrations can be seen over large cities as a brownish haze. The Canadian Council of Ministers of the Environment’s (CCME) websiteii indicates that the possible long-term exposure to NO2 to human health includes the development of allergic responses, asthma, and an increase in susceptibility to respiratory infections. Inhalation of NO2 has also been linked to cardiovascular system and some reproductive effects. Short-term exposure of NO2 can decrease lung function, increase respiratory symptoms, and airway inflammation, and cause aggravation of respiratory diseases. In addition to the formation of ozone, other environmental effects include possible altered plant growth and yield due to absorption of NO2 by plants through their leaves. Indirect effects occur when NO2 (and other NOx) reacts with water and oxygen to form acid rain, resulting in acidification and eutrophication of ecosystems. The CCME developed Canadian Ambient Air Quality Standards (CAAQS) to be used in Air Quality Management Systems (AQMS) in air zones and airsheds. The AQMS is intended to provide a comprehensive approach for improving air quality in Canada and to publicly report on Canada’s air quality. CAAQS for nitrogen dioxide (NO2) were recently endorsed by the CCME. The most recent standards published by CCME for NO2 are shown on Table 1. 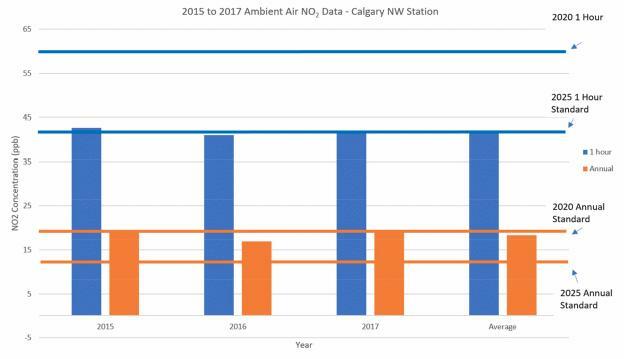 Figure 1 and Table 2 presents a comparison of the new 1-hour and annual NO2 CAAQS criteria to NO2 measurements taken from 2015 to 2017 at CRAZ’s Calgary NW Stationii. Based on these measurements the 1-hour NO2 levels just meet the new 2020 1 hour criteria. The 2015-2017 NO2 CRAZ annual data exceed the new 2020 annual NO2 criteria. Note: The Average column is the 3-year average of annual 90th percentile of daily maximum 1 hour average concentrations. This is a close comparison with the CAAQS requirement of the 3-year average of the annual 98th percentile of the daily maximum 1-hour average concentrations. In “Part 2 – The New NO2 CAAQS” we will discuss the contributors of NO2 and programs to address NO2 emissions in the CRAZ.